Congressman Brian Higgins (NY-26) testified before the International Trade Commission (ITC) during a hearing about their investigation on tariffs on the import of Canadian uncoated groundwood paper, used in local newspaper printing nationwide. At the hearing, Congressman Higgins testified: "The freedom of the press is one of the central tenants of the first amendment of the constitution. Newspapers have always been an integral part of how Americans are able to achieve the full aims of this freedom – through the promotion of a marketplace of ideas. Newspapers have availed the public with essential information about their neighborhoods. Newspapers are unique in comparison to other mediums in that they are the most cited source citizens use for news about their local town or city, arts and culture, or schools and education. This is why I am concerned about the imposition of duties on newsprint that this petition would result in." In June, Congressman Higgins was joined by New York Representatives Elise Stefanik (NY-21), John Faso (NY-19), John Katko (NY-24) and Sean Patrick Maloney (NY-18) in a letter to Commerce Secretary Wilbur Ross requesting that the negative impact of the tariffs be reconsidered. The tariffs were initially imposed by the administration in January and increased to up to 32% in March. More than 50 members of Congress have signed on to similar letters to the Commerce Secretary and the ITC. Survey results from the News Media Alliance showed that New York newspapers reported an average increase of over 17% in newsprint costs since the implementation of the tariffs. Nationwide, over 90% of respondents indicated that those costs can't be passed on to consumers, and 70% have already cut news coverage to make up it. Higgins went on to testify: "Local newspapers are also confronting a decline in newspaper circulation, readership and print advertising due to increased internet competition. While some have been successful in cultivating digital content, increasing digital subscriptions, and procuring online advertising, others will be more exposed to the risk of shutting their doors. Duties this Commission could affirm would accelerate this decline and may leave portions of my community without access to vital information about our homes and neighborhoods." The ITC will be accepting final comments until late August, and is expected to issue their decision in September. 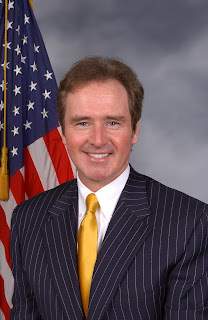 Congressman Higgins' full testimony can be read here.